« What’s Cooking at Berkeley’s Kitchen? This entry was posted on February 27, 2010 at 2:23 PM and is filed under food book giveaways. You can follow any responses to this entry through the RSS 2.0 feed. You can leave a response, or trackback from your own site. I’d love to try the Easier-Than-You-Think Twice-Cooked Broccoli – I can never seem to get my broccoli cooked right! It’s difficult for me to believe that I am as old as I am, and don’t know my way around the kitchen. This sounds terrific, because I really need to figure out how to get started. We have just moved and I now have a decent kitchen, so I have run out of excuses. Have had Mollie’s books for years, even when I wasn’t a vegetarian. She’s a great person too, and have always loved her whimsical drawings. are always squeezing on that end anyway. I am going to make the Potato Soup with Rosemary and Roasted Garlic for supper tomorrow night. Hope it taste as good as it sounds. Potato Salad. I can never get it creamy enough. I would like to learn how to make homemade pretzels. I would like to learn Vegetable-Tofu Stir-Fry with Orange-Ginger Glaze because I want to master tofu. I WOULD LIKE TO MAKE A GOOD DISH OF SWEET AND SOUR CHICKEN. I’d like to learn to bake bread. I would love to revisit proper knife sharpening. I often shy away from goat cheese, although I have read much about the benefits and authentic flavor. I’m ready to dive in. Help me Mollie, goat cheese here I come. I wish I knew how to use knives to chop quickly like they do on TV. I also wish I knew how to can and freeze. The recipes sound yummy! I’d like to try making the Artichoke, Goat Cheese, Tomato, and Red Onion Focaccia. Once I read about the Roasted Butternut Squash and Apple Soup in your review, I was hooked. I would definitely love to learn to make that. I love soups, and the White Cheddar Mashed Potato Soup sounds like the ultimate comfort food. I would love to make it for my family! 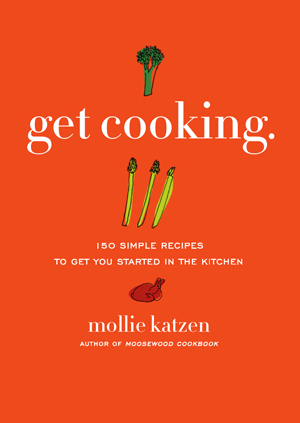 I’m a huge fan of Mollie Katzen’s cookbooks. This sounds like one I need. I would love to try the chickpea and mango curry. I’d love to get back to bread making. I’d love to learn how to make crepes. Stuffed peppers would be awesome! I would love to learn how to make Thai dishes. I would like to learn knife skills and how to master several key dishes. I love Mollie’s cookbooks. I have always been a fan of Mollie Katzen from the first Moosewood Cookbook. I would love to make the corn and avocado salsa. Yum, summer here we come! I’m a brand new vegetarian determined to get healthy by cooking healthy & eating healthy! I need all the help I can get—especially when it’s from the best cooks! Thanks! I would like to try the Pan-Fried Chicken Cutlets. It looks simple enough and tasty. Thanks for this giveaway. It sounds like an awesome read. I am always looking for new recipes. I would love to try the Acorn Squash Stuffed with Apple-Almond-Cherry Basmati Pilaf…Sounds wonderful to me!! I would like to try the Banana Bread. I’d like to learn to make a great pasta sauce. I’m a pretty good home cook, but I have no knife skills. I’d like to learn how to (safely) use a knife. Would like to make a great Tortilla Soup to share with my friends. Would love to try the Asparagus Crepes with Spiked Mushroom Sauce. Sounds yummy. I really like Mollie’s kids’ cookbooks as well. I would love to be better at cooking fish. I need a good stuffed pepper recipe. I had one and lost it!! I would love to learn some more one-pot meals, for those busy weeknights when a major cleanup gets pushed to the back burner. Great post and review. Mollie’s book sounds great. Boy would hubby be surprised if i learned some recipes and succeeded!! I’d like to learn how to make sauerkraut!! Love all of Mollie’s cookbooks. I photographed her a few years ago. She’s a gem, no? Thanks for the fun contest. It’s inspiring to read all these comments everyone! I’d like to try the sunlight souffle. i want to try the pan fried chicken cutlets. I want to get better at my homemade pretzel making! I’d like to try the Greek Pizza. I would like to try the homemade pretzels. I need knife skills. Dicing anyone? I would like to learn how to make Italian wedding soup. I’d like to try the recipe for skillet potatoes with fried onions. Yum! Believe it or not, both my husband and I love Brussels Sprouts, but other than steaming them, I haven’t a clue what to do with them. I want to learn more recipes for using legumes. I’d love to learn to make better lasagna. Thanks.